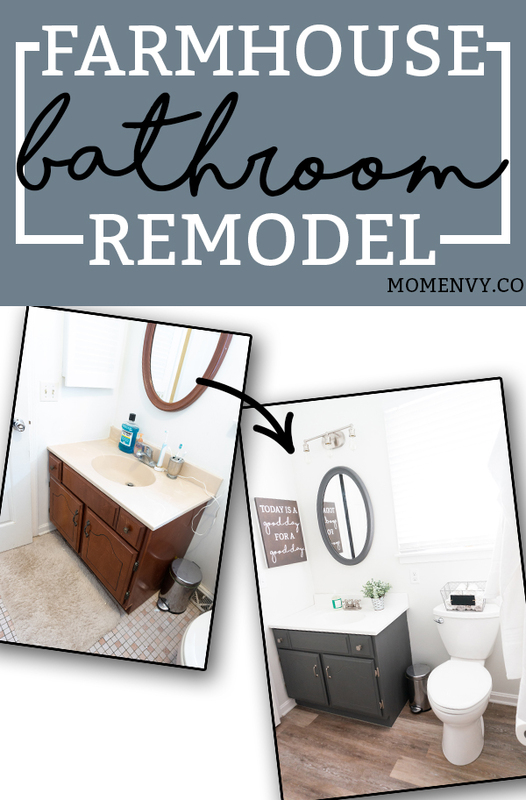 It has been such an exciting six weeks remodeling our master bathroom. I still can’t believe just how different it looks. Our bathroom is far from the 80’s pink nightmare it was before. So let’s do things differently this week and start with the pictures and end with the details. 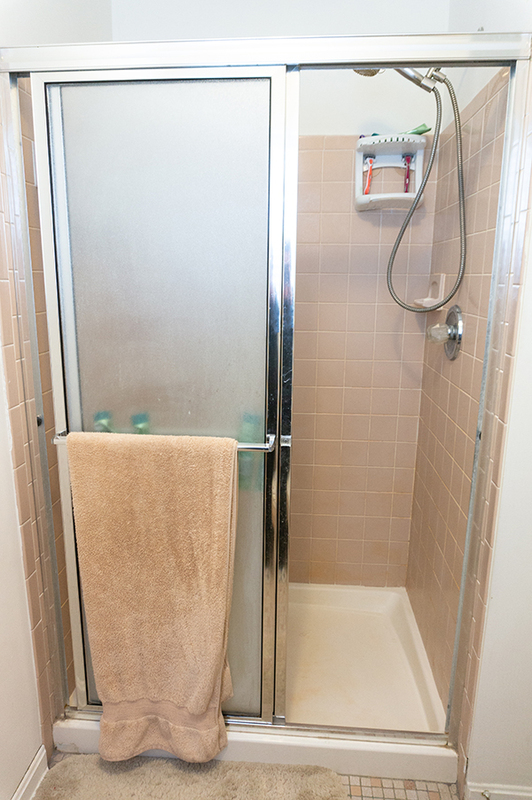 Just in case you forget, here is the before (click here to see even more before pictures). 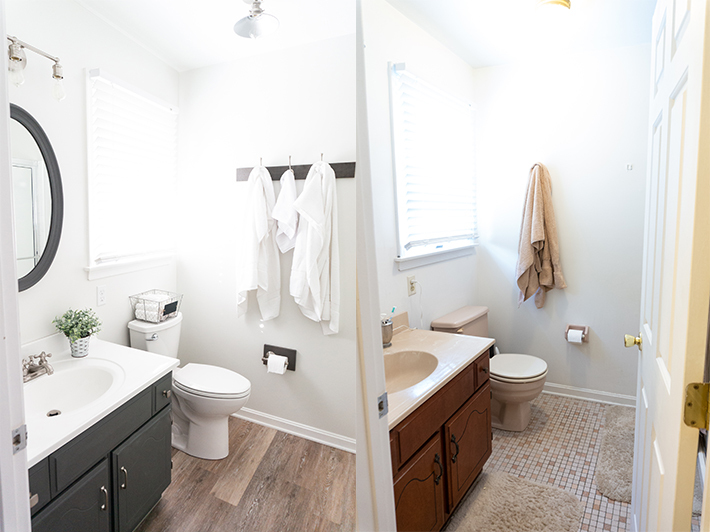 In my opinion, the biggest change in the room was the painted pink tile. 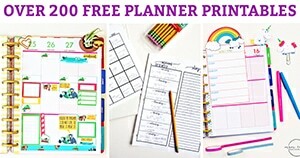 I was so nervous to tackle such a big project and have it fail. It turned out better than I could have hoped. It really looks and feels like brand new white tile. 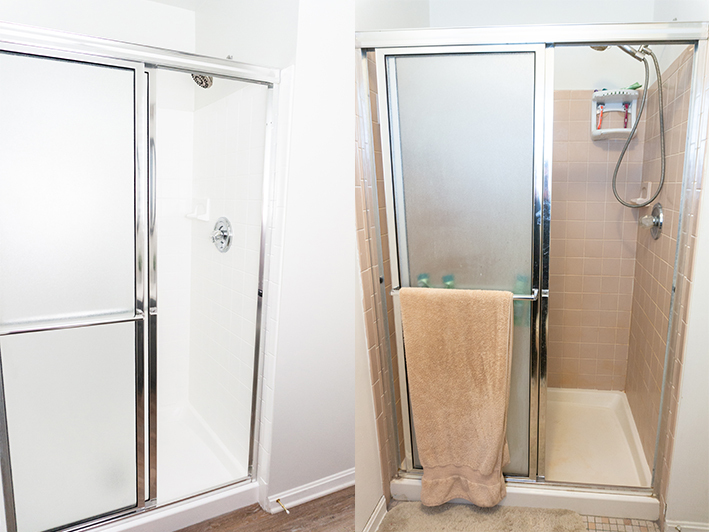 If you’d like to learn how we refinished the tile (for very little money! 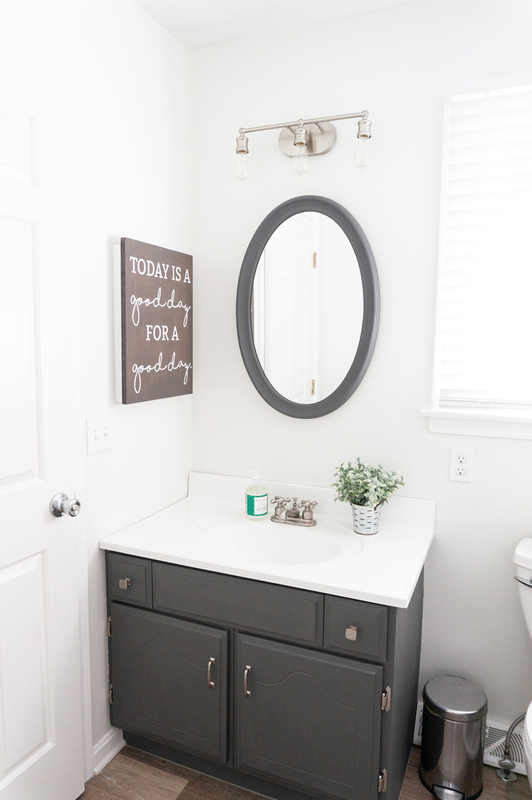 ), check out the post here: Can you Paint Tile? You bet you Can! We painted the bathroom vanity in Waverly’s Elephant. Next, I replaced the knobs and pulls from Wayfair. 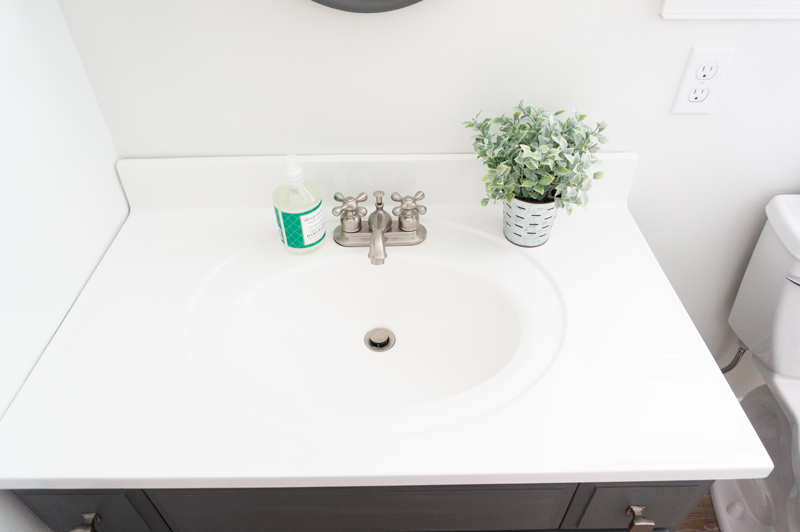 Lastly, my husband installed a new white countertop. I love the contrast of the bright white and dark gray. I love our new bathroom lights. 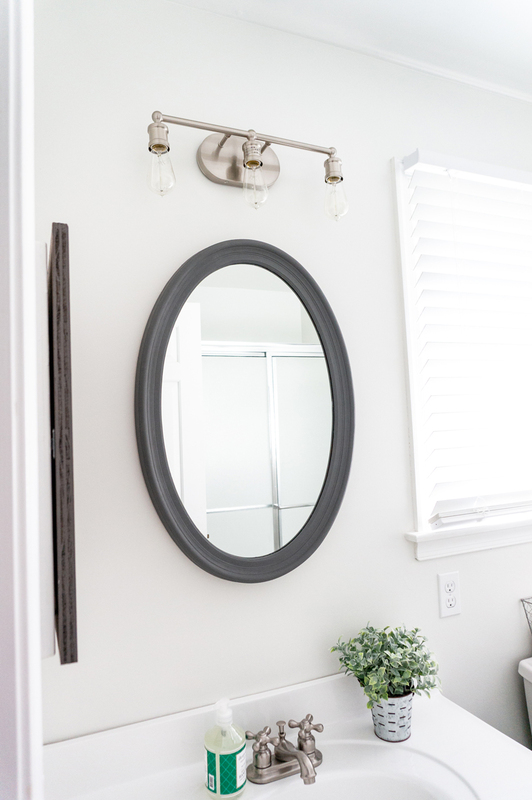 You all helped vote and pick them out in this post here – inexpensive bathroom vanity lights. 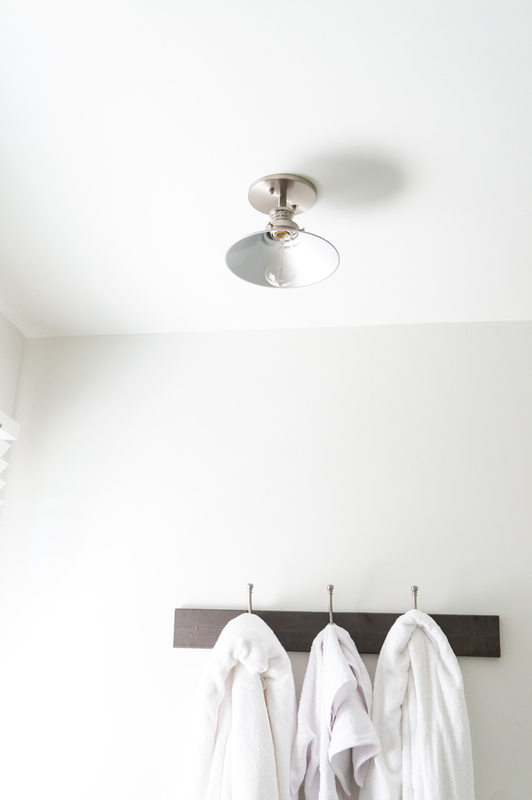 The photographs don’t do these lights justice – they add a little bit of an industrial look to our farmhouse styled bathroom. I love their simplicity. 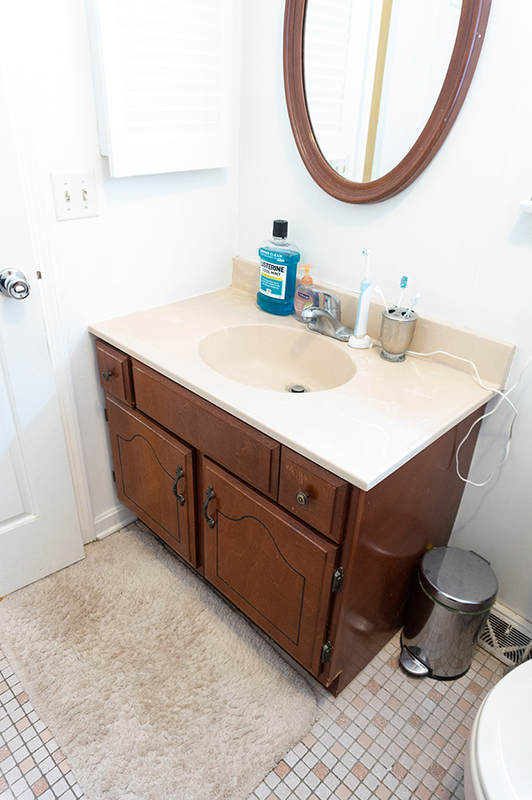 We placed the same vanity light above the bathroom makeup vanity as well as the sink. Then, we added this overhead light from Amazon. My Dad installed the beautiful flooring for us. It is vinyl plank flooring from TrafficMaster at Home Depot in Khaki Oak. 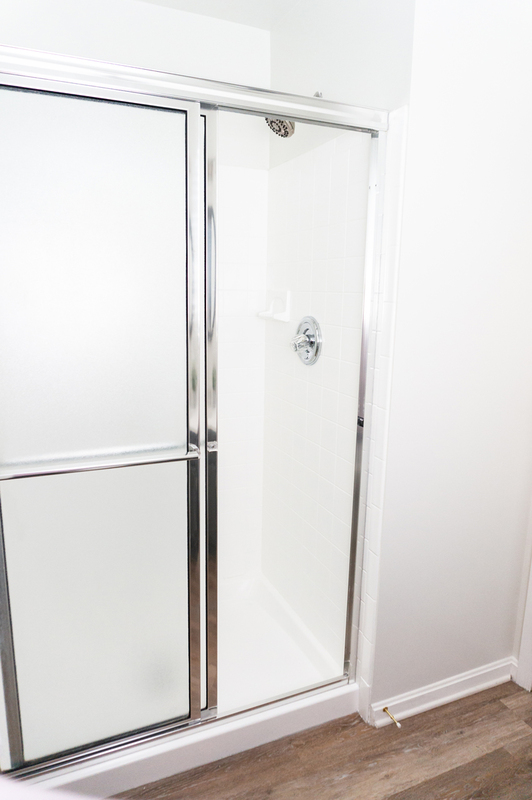 The color works perfectly with the gray cabinet and because it’s 100% waterproof, it is a warmer alternative to tile. 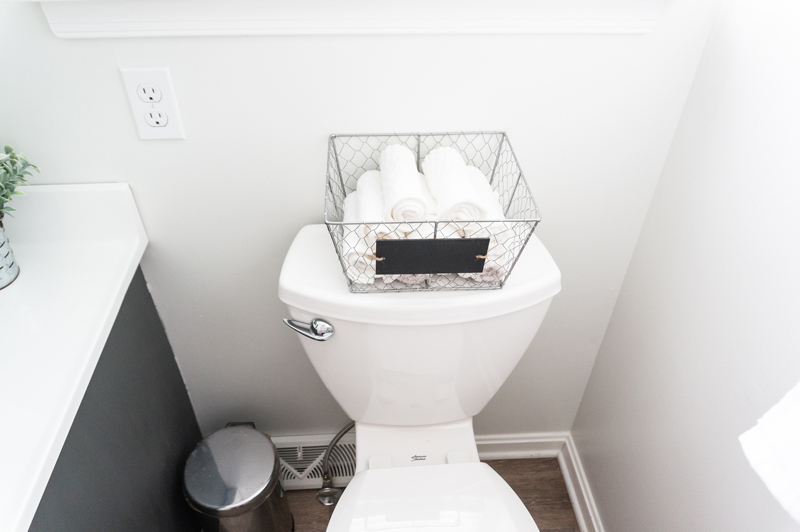 I wanted to find a way to make the bathroom space more private. In the morning while getting ready, the vanity light easily would wake up my husband. 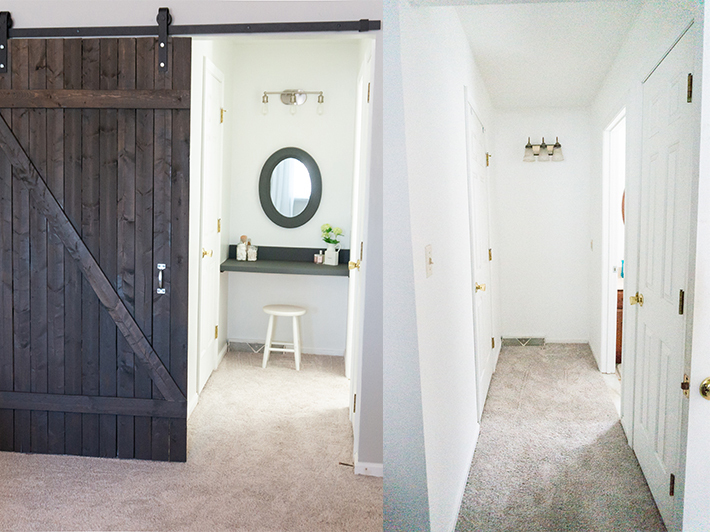 We chose to install a barn door to give the room more of a farmhouse feel. 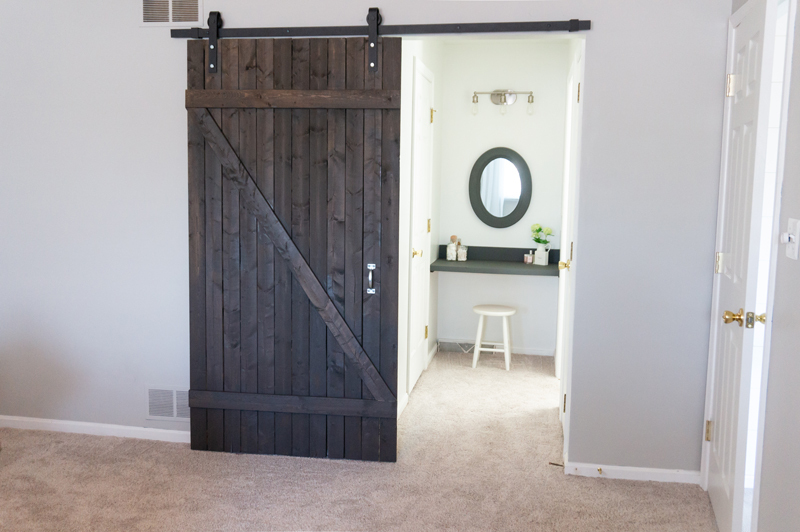 Honestly, if there is anything I wanted to take from our house to the new one, the barn door would be it. My Dad and I built it together for under $100 – including the track. 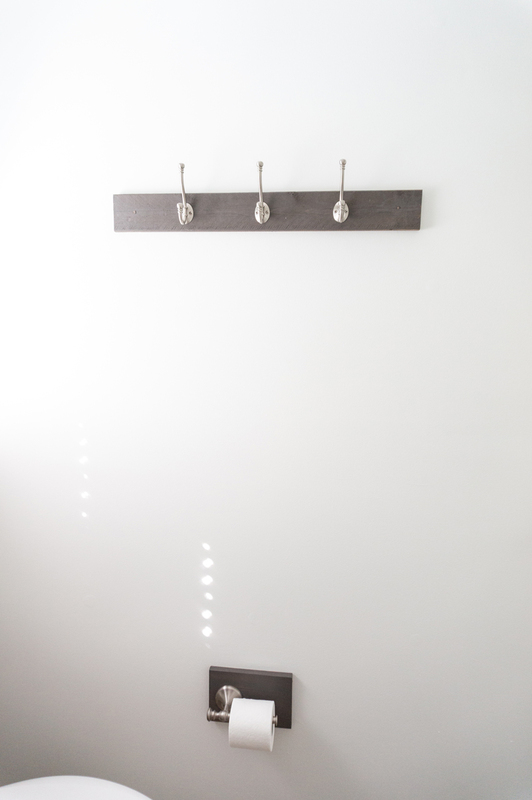 Its rustic feel adds so much to our bedroom as well – it’s like a piece of art. 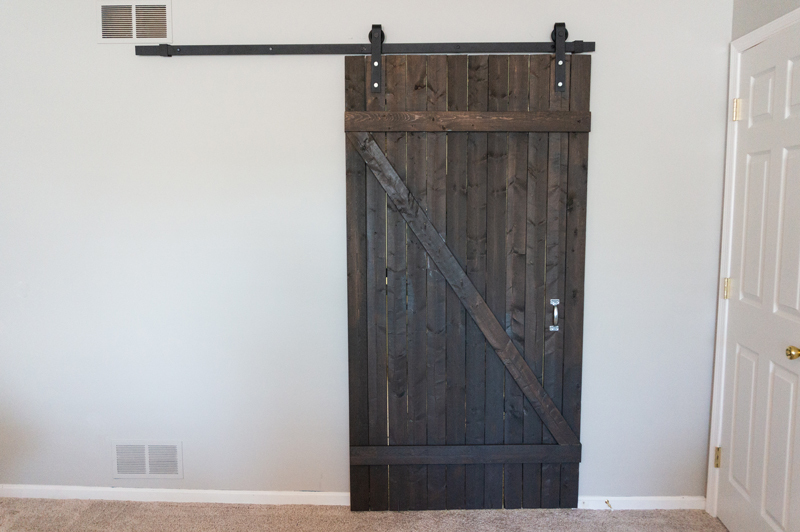 Learn how we built it here: Inexpensive Barn Door. We replaced the medicine cabinet door with a piece of stained wood. Then, I added some vinyl to make it look like a wood sign rather than a door. You can download the free print and SVG file for it here: Today is a Good Day for a Good Day Farmhouse Print. 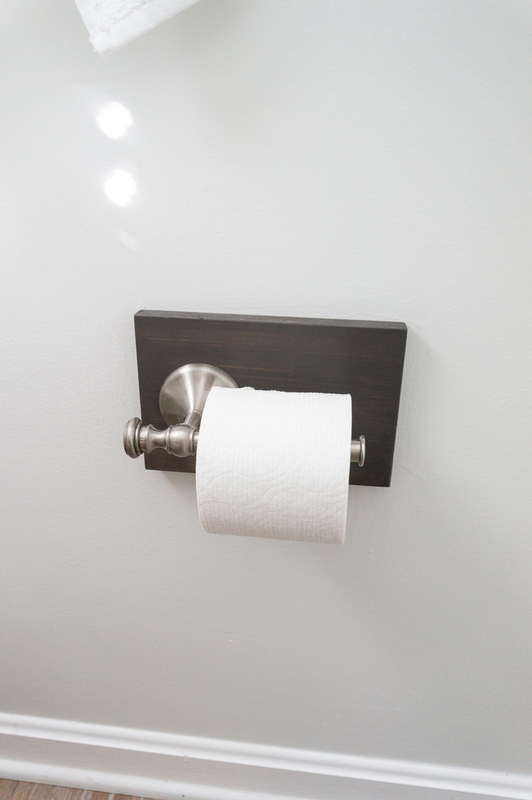 My Dad helped me design and build wood backings for our toilet paper holder and towel hooks. I wanted to add a rustic feel while keeping things clean and simple since we’re about to put our house on the market. 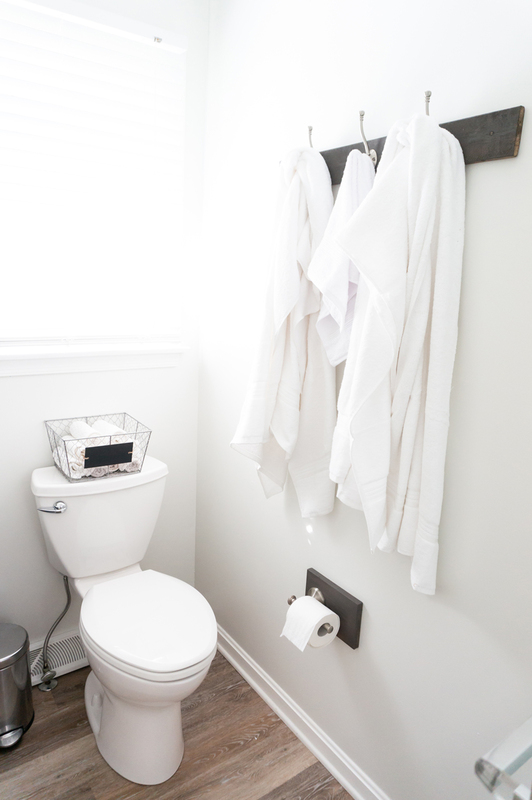 The towel hooks came from Target and the rest of the details came from Home Goods or Marshalls. Again, I didn’t go overboard with the decorating because we are in the process of staging our home. 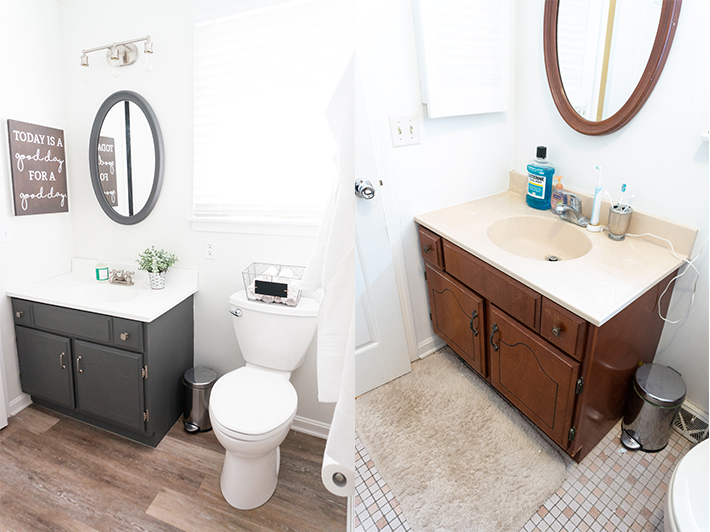 We are loving our new bathroom. I wish we had remodeled it sooner. 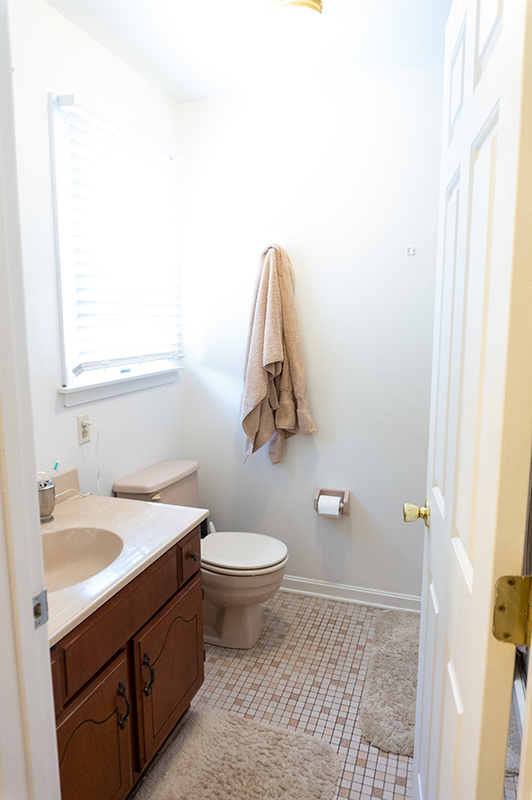 But now, the new owners will be able to enjoy a freshly remodeled bathroom. 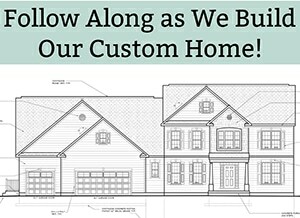 It was bittersweet because it’s the last remodel project we will complete on our current house. I put together some side-by-side pictures to see the real difference from the old to new. 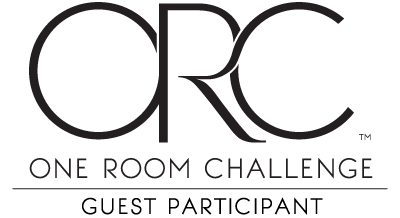 If you’re looking for the other weeks from the One Room Challenge, find them below. 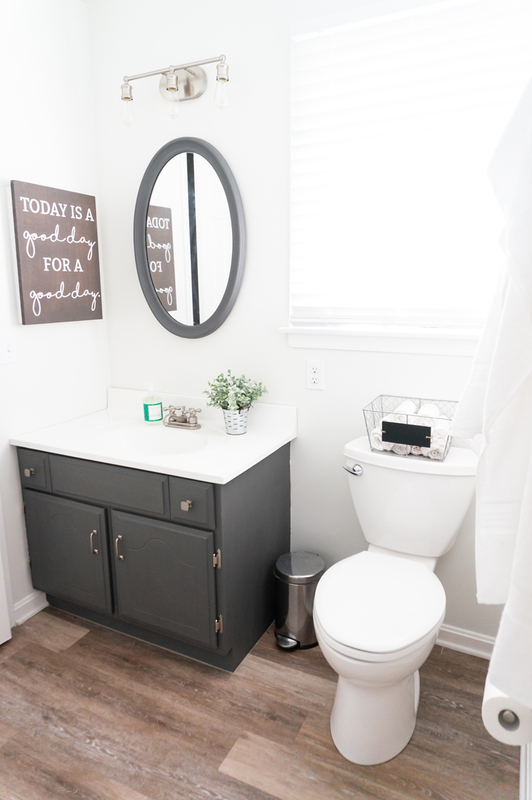 Week Three: Can You Paint Tile? You betcha! 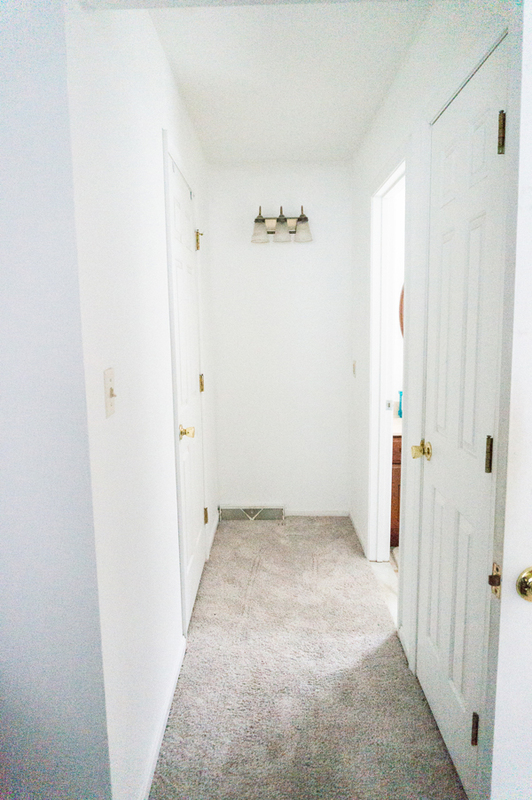 If you want to see our first one room challenge, check out how we shiplapped our foyer. 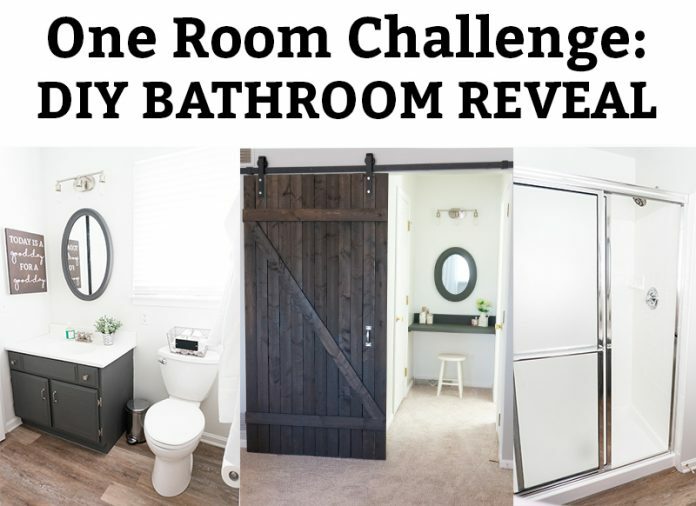 If you’ve never heard of the One Room Challenge before, make sure to check it out. Twice a year they select participants to redo a space in six weeks. Yep, six weeks. 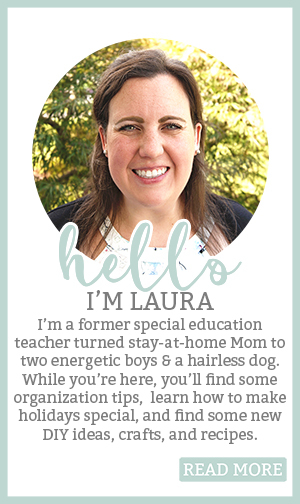 In addition, anyone can join as a guest participant (which is what I am doing now and also what I did when we made over our foyer in the fall). 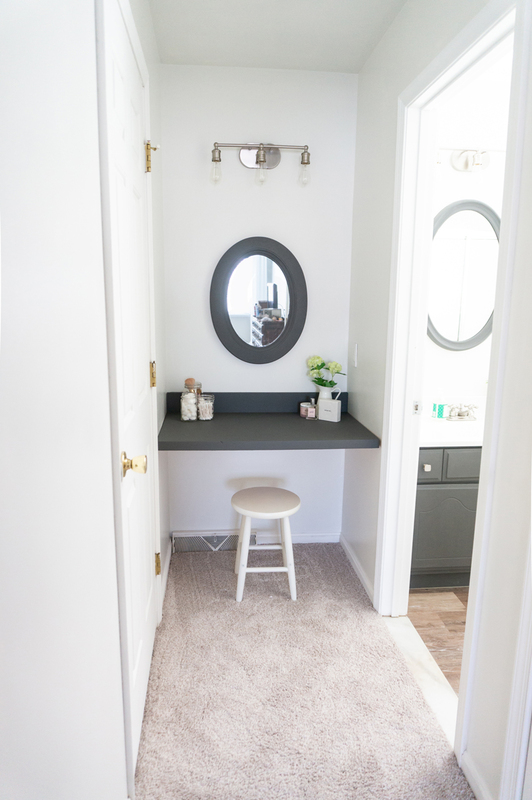 It’s one of my favorite times of the year because I love to check out everyone’s makeovers to get some new home inspiration. You can see all of the other guest participants entries for week one here. Here are the entries from week two. Week three. Week four. 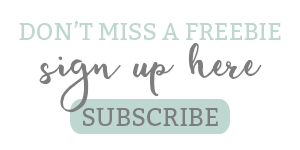 Check out many other amazing decor projects over at her Before & After link ups! 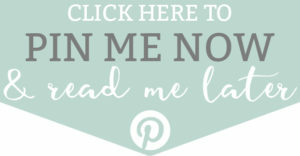 Click here to get some inspiration. Wow!!! Just wow!! What an amazing transformation!! 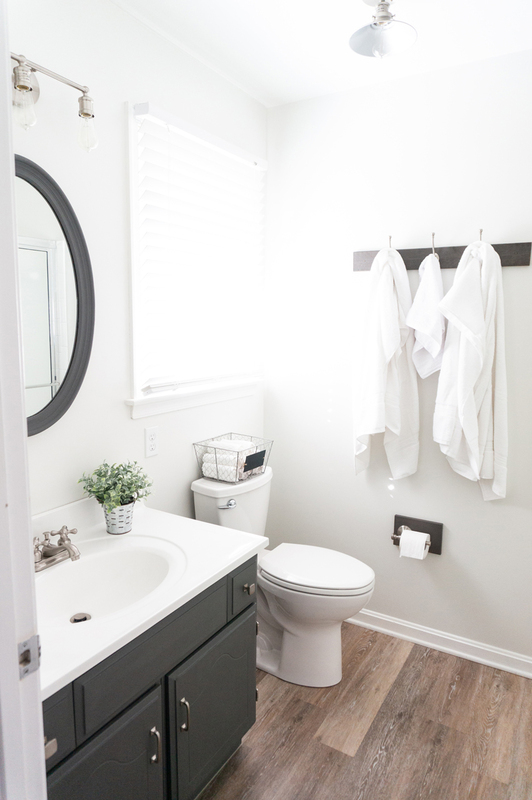 Everything looks so bright and airy, the barn door is perfect and I love the newly painted vanity. Congrats on a beautiful makeover!! I love this farmhouse look! 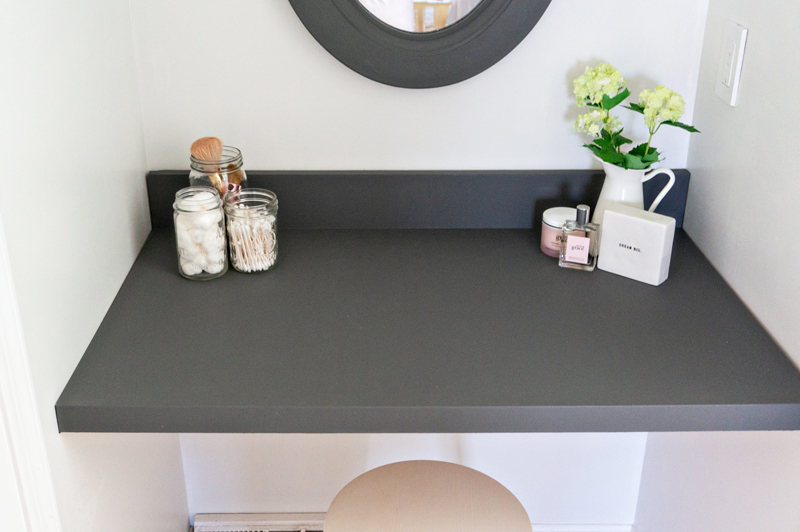 The dark charcoal gray is perfect with the new floors! Very nice job!